This document walks you through the relational database (RDB) open source features in the Eclipse Web Tooling Project. You must have either the RDB open source binaries or the source code downloaded from the Eclipse Web site. 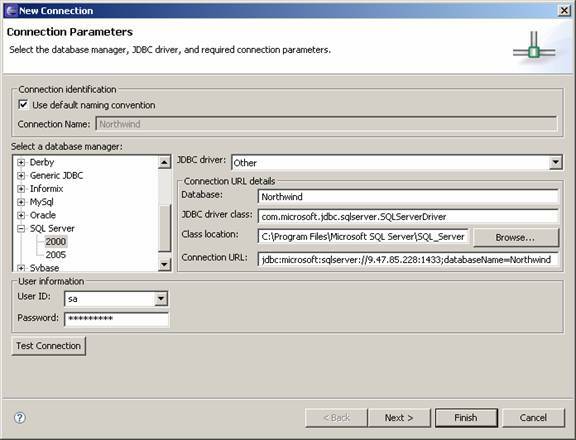 Connection Wizard – Create a live connection to the database server using the JDBC driver. Data Output view – View the messages, parameters, and results that are related to the database objects that you work with. 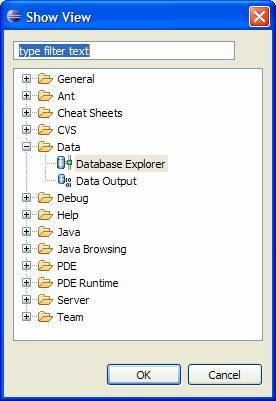 Database Explorer – Support the live view of database server elements including tables, views, stored procedures, and user-defined functions. In the Database Explorer, you can also view a database sever in an offline mode. Data Browse – Browse table content from the connected database server. SQL Scrapbook – A SQL utility/editor which can be used to construct SQL commands to be executed to a connected server in the Database Explorer. Click Window -> Show View -> Others -> Data, then select Data Output and Database Explorer. In the Database Explorer window, click the New Connection toolbar button. Select the database that you would like to connect to, and fill in the JDBC connection information. Note: The Test Connection and Next buttons will not show up unless all of the required information has been filled in. Note: If you are connecting to SQL Server 2000 using the MS JDBC driver, you must specify the path to the three required jar files (for example, mssqlserver.jar, msbase.jar, and msutil.jar). Click OK to close the confirmation window, then click Next. Set filters as appropriate. You can also filter after the connection is made. In a future milestone, you will be able to filter schemas, tables, views, stored procedures, and so on, from the folder in your Database Explorer. In the Database Explorer, expand the Server node and view the folders for schemas, tables, views, stored procedures, and so on. From the Database Explorer, you can reconnect to a server. Right-click on the disconnected server, and select Reconnect. To save a new object in the Database Explorer, right-click a server connection, and select Save Offline. Currently, the Database Explorer only supports read-only mode. You can get read/write mode by generating a DDL to run on the database Server. In the Database Explorer, right-click a table, and select Data -> Sample Contents. From the Database Explorer, click the Open SQL Scrapbook icon. Choose a connection to associate your scrapbook with. Specify a folder name and a name for your sqlpage file. Click File -> New -> Other, expand the Data node and click SQL Scrapbook Page. Type a name for your sqlpage file. For example, CreateTable.sqlpage. Click Finish. The SQL Scrapbook opens in the editor area. Right-click in a blank space in the SQL Scrapbook and select Use Database Connection. The Connection Selection window opens. Select a server, and click OK.
To run the SQL, click Run > Run SQL from the main menu. After you run the SQL, the view is automatically refreshed. If you want to manually refresh the view, right-click the folder in the Database Explorer, and select Refresh.